Mom and Dad, Karen, Richard, Julie, Tammy, Keith, Michelle, Alissa, Kristin, Jenny, Marian, Susan, Anna Claire, Laurie, Bonnie, Aimee, Elizabeth, Anita, Katie, etc. All women (and a few rock star men who weren’t scared to teach me the Bible and tell me my boyfriends were lousy), who have invited me to pull up a chair to the table of their lives. They’ve given me a front row seat to their decisions, marriages, parenting, friendships and walks with Jesus. They’ve intentionally taken time away from their own lives and invested it in mine. These disciplers have walked beside me in both the boring day-to-day and the dramatic once-in-a-lifetime. They’ve called back to me from a few steps ahead and charted the course by giving me hope, vision and ideals. They’ve asked me the hard questions to help me deal in reality and see myself for who I really am. They’ve been generous with their resources, networks and their time. They’ve laid down their rights and conveniences for mine. In each stage of life I’ve needed someone who would create space for my questions and need for prayer. Someone who could act as a mirror to my soul. (And who could show me my need to pluck the stray eyebrows of that precious soul, if you know what I mean.) These people have left such a legacy and I am beyond grateful. Their presence in my life has created a desire to turn around and look for those journeying behind me. they create leaders more compelling than themselves. No matter what season we are in, there’s guaranteed to be someone who can benefit from our life experience and wisdom. When these relationships are infused with the hope of Jesus, the lost world will be drawn to Him. And even still God uses broken people to help broken people. His grace is sufficient for me and for those He entrusts to my care. So, who is the middle school girl trying to make it through the 8th grade unscathed? Where’s the college freshmen just trying to figure out how to walk with Jesus on her own for the first time? That young mom who looks like they haven’t had a good night of sleep in well over a year? She hasn’t. Go hold her baby and let her take a shower and a nap. The seemingly glamorous professional who seems to be jet setting and enjoying her busy life? She’d love to be treated to brunch and given some good ole’ fashioned eye-contact and a listening ear. Who’s the dear one you could intentionally journey with for a season? Whose eyes could you lift with your hindsight to give them a more true picture of God? Text that person. Set up a walk or a coffee date. Ask a soul-stirring question and see where God takes things. Perhaps walk through a book of the Bible, have them in your home weekly or serve together. No clue who that person would be? Start a small group in your neighborhood, workplace or church rallied around a season of life or struggle. Promote and see who shows. Who knows? You could be “that person” for an entire group of women or maybe even one would rise to the top. Let’s listen to the Lord together and see how He might lead us. By faith, let’s be who we needed when we were younger. Love, love, love this. Thankful for this fresh breath of words. So thankful to watch YOU be this to so many others!!! Love you, friend. Love this! “I’ve discipled people more to myself than to Jesus…” Such a good reminder. Thank you for speaking truth! I love the tag line Be you who needed! I am direct a youth mentoring program and I have seeking a new marketing tag line to be used. We have used WHO MENTORED YOU? Pass it on. 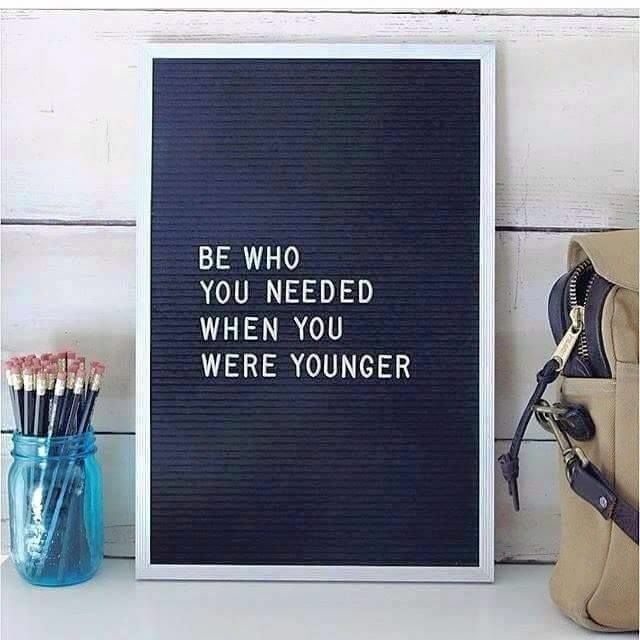 Mentor a child. for the past 8 years. I have several youth waiting for a mentor. We recently received funding to be able to direct some dollars towards purchasing a $500 banner. I am wondering if you would allow me to use the line for our program. Thoughts? I agree with Jennifer about drawing more people to me than to Jesus.